L.A. Noire finally drops the shiny cinematic veneer of previous trailers and lets us take a peek at the equally shiny nitty-gritty of gameplay. L.A. Noire is looking better by the day. Using the vaunted MotionScan technology, Team Bondi has managed to make characters look, walk, and talk like real people. And lucky for us, they have now managed to make the heads sync up with the bodies (a problem noticeable in some of the earlier trailers). The trailer also reveals several of the mechanisms and menus used to function in the game world. When investigating a crime scene, you may find an out of place object or suspicious bit of detritus. Picking it up, you will be able to navigate around the significant parts of the clue, finding the serial numbers on a gun, or the various objects found inside a wallet. Using these clues, you will start asking questions of witnesses and suspects. The interrogation options menu will take the form of your notebook, and will allow you to review your notes on the case and find inconsistencies in the suspect's story. But there's more to the game than just investigation. The trailer also shows several instances of in-game action, from shoot-outs, to fisticuffs, and even car chases. 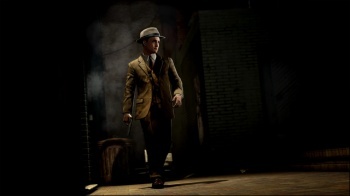 There are also shots of Cole Phelps, the main character, having to trail and discreetly observe suspects, adding a stealth element to the game, as well. Part point-and-click adventure, part shooter, and part open-world sandbox, L.A. Noire promises at the very least to be one of the most detailed games yet made. I am very much looking forward to it. The game will be released May 17th for the Xbox 360 and Playstation 3. The trailer can be found here, and is age-gated due to the fact that the L.A. Noire will be rated M.